NETWORK FINALS: Because of the many adjustments to the night’s ratings, a full analysis follows. Comparisons are to last week. 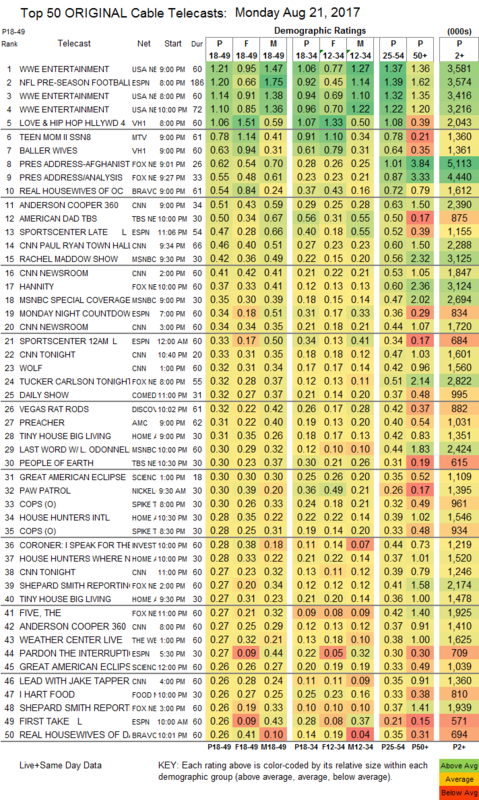 ABC: BACHELOR IN PARADISE fell 0.03 to 1.3, and a BLACK-ISH rerun followed at 0.5. 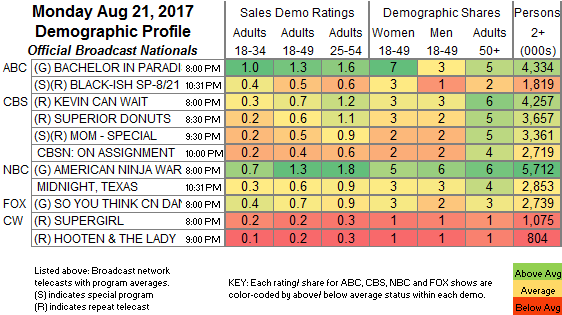 NBC: AMERICAN NINJA WARRIOR (1.3) and MIDNIGHT, TEXAS (0.6) were each down 0.1. FOX: SO YOU THINK YOU CAN DANCE was steady at 0.7. CBS: CBSN: ON ASSIGNMENT held at 0.4, after sitcom reruns at 0.5-0.7. CABLE HIGHLIGHTS: USA’s WWE telecast topped the night at 1.21/1.14/1.10, compared to last week’s 1.21/1.15/1.05. ESPN’s Preseason MONDAY NIGHT FOOTBALL game was at 1.20. On VH1, LOVE & HIP-HOP dropped 0.09 to 1.06, and BALLER WIVES was down 0.16 to 0.63. Cable news was dominated by the PRESIDENTIAL ADDRESS, which gave Fox News the night’s win at 0.62/5.1M, while CNN’s ANDERSON COOPER 360 was at 0.51/2.4M during that hour, and MSNBC’s RACHEL MADDOW SHOW was at 0.42/3.1M. On MTV, TEEN MOM gained 0.02 to 0.78, and SIESTA KEY was down 0.07 to 0.25. Bravo’s REAL HOUSEWIVES OF ORANGE COUNTY dipped 0.07 to 0.54, and REAL HOUSEWIVES OF DALLAS was down 0.07 to 0.26. On TBS, AMERICAN DAD rose 0.02 to 0.50, and PEOPLE OF EARTH was up 0.02 to 0.30. Discovery’s VEGAS RAT RODS was at 0.32. On AMC, PREACHER fell 0.05 to 0.31, and LOADED was off the chart, down 0.01 to 0.04/178K. HGTV’s TINY HOUSE BIG LIVING was at 0.31/0.27, compared to last week’s 0.28/0.27, HOUSE HUNTERS INTL was down 0.05 to 0.28, and HOUSE HUNTERS WHERE ARE THEY NOW was at 0.28. Original episodes of COPS on Spike were at 0.30/0.28. On ID, THE CORONER gained 0.02 to 0.28, and GONE held at 0.24. Food Network’s I HART FOOD climbed 0.03 to 0.26. A&E’s ESCAPING POLYGAMY climbed 0.03 to 0.25, and INTERVENTION ticked up to 0.21. TNT’s WILL was steady at 0.08.